Observation - Marble Gall - UK and Ireland. 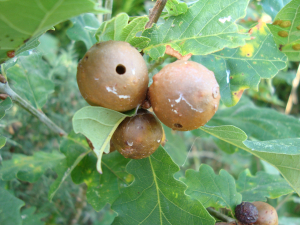 Description: Woody growths on oak sapling caused by gall wasp Andricus kollari. Circular holes suggest successful pupation of agamic stage. Woody growths on oak sapling caused by gall wasp Andricus kollari. Circular holes suggest successful pupation of agamic stage.